Working together for a common cause. Prime Minister Voreqe Bainimarama receives a cheque donation from the Opposition Leader Ro Teimumu Kepa. Cyclone Winston may have long gone, but its impact will still be felt come 2018 – through the ballot box. Many international studies have shown that there are political implications of natural disasters. No matter how much we try to separate politics from relief and rehabilitation work in the wake of natural disasters, it’s the people or the voters who will have the final say in the general election. Disasters hurt all Fijians, the poor, rich, businesses and workers. It’s how the Government of the day responds to relief and rehabilitation of the devastated that shapes people’s opinions and judgment. Some people will always blame Government for their suffering in a disaster even though it has no control of it. But they are known to have changed their position when relief supplies arrive immediately after a natural disaster followed by rebuilding supplies. 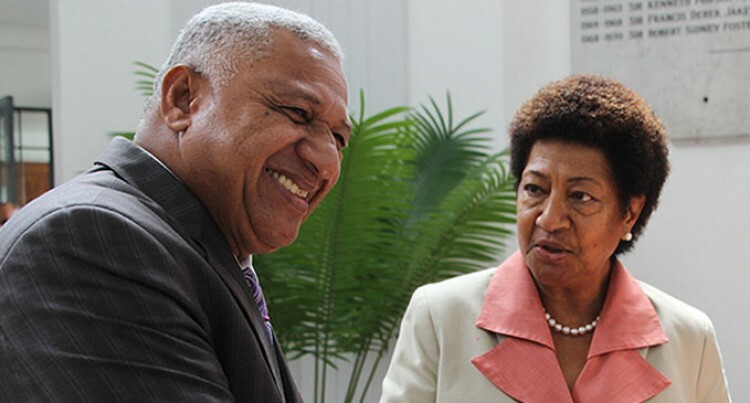 Disasters should be one of the few times that Fijians from each side of the political divide tend to come together. They put aside their political biases and work together for the common good. Initially, anti-Government forces criticised the setting up of the Prime Minister’s Disaster Relief and Rehabilitation Fund. Their political parties may live to regret that stand. The SODELPA parliamentary caucus realised that it is political suicide to start criticising Government’s national relief efforts. What it needed to do was join it. It prompted SODELPA MPs to collect $73,000 and Opposition leader Ro Teimumu Kepa donated the cheque to Prime Minister Voreqe Bainimarama. That was a smart move although it was criticised by some senior party officials. Ro Teimumu must have received sound advice to go ahead and do it. The worst that can happen is to be seen as trying to frustrate Government efforts. When the current momentum is with the Government, it is politically more profitable to piggyback on it. The party can be seen as supporting the national interest and could pick up votes from undecided voters. Rather than taking a confrontation stance, the party must also inspire those who are suffering to regain the confidence they need, to move forward. Mr Bainimarama, has been exemplary in inspiring victims of Cyclone Winston to adopt a positive attitude. The Government initiatives like Help for Homes, Adopt a School and Adopt a Village have resonated well with the people. How leaders respond to Cyclone Winston relief and rehabilitation, can determine how the public sees them in the years to come. A research shows disasters provide a moment in the spotlight, when voters can see with unusual clarity who is acting on their behalf. “The evidence suggests that the answer is “yes,” at least if the question is about disaster responses.